کم‌ژرفا (Shallow Benthic Zones= SBZ) و همچنین نانوفسیل‌های آهکی مطابق با زون‌های استاندارد جهانی (Nannofossil Paleogene= NP) مورد مطالعه زیست‌چینه نگاری قرار گرفته است. این مطالعات با تمرکز روی تجمعات روزن‎بران کف‌زی بزرگ همچونEorupertia magna (La Calvaz), Fabiania cassis (Oppenheim), Eoannularia eoconica (Cole ve Bermudez), Gypsina sp., Textularia sp.,Nummulites perforatus (De Montfort) Nummulites sp., Discocyclina sp., Rotalia sp., Acervulina sp. و نیز نانوفسیل‌های آهکیCribrocentrum reticulatum, Sphenolithus obtusus, Sphenolithus spiniger, Sphenolithus editus, Helicosphaera compacta, Coccolithus pelagicus, Coccolithus eoplagicus, Discoaster siapanensis, Discoaster barbadiensis, Discoaster sp., Reticulofenestra sp., در توالی آهکی برداشت شده انجام پذیرفت. 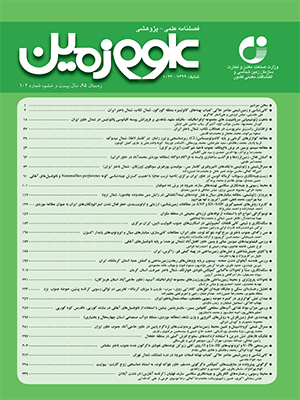 در نتیجه، با توجه به گونه‌های شاخص شناسایی شده، زیست‌زون‌های SBZ15?-17 مربوط به روزن‎بران کف‌زی بزرگ و زیست‌زون NP16 از نانوفسیل‌های آهکی در توالی مورد مطالعه جدا شد، که بیانگر سن لوتشین پسین- بارتونین پیشین (ائوسن میانی) است. همچنین مرز اشکوب‌های لوتشین- بارتونین بر پایه گونه‌های شاخص نانوفسیل‌های آهکی به‎طور دقیق جدا شد؛ به‎طوری که اولین ظهور گونه روزن‎بری N. perforatus (de Montfort) در بخش میانی توالی نهشته شده در طی زمان اشکوب بارتونین ثبت شد. بنابراین، این امر گویای این مطلب است که در ایران همانند دیگر بخش‌های باختری حوضه تتیس اولین ظهور گونه N. perforatus (de Montfort) در بارتونین پیشین (SBZ17) رخ داده است. همچنین در این مقاله سیستماتیک گونه N. perforatus (de Montfort) بر پایه ویژگی‌های تیپ‌شناسی و بایومتریک مطالعه و توصیف شده است. The Eocene marine deposits in the Chenarbu section in Torbat-e-Jam region (eastern part of Central Iran Zone) have been biostratigraphically studied based on large benthic foraminifera coincide with Shallow Benthic Zones (SBZ) and Calcareous Nannofossils, according to standard worldwide zones (NP). This investigation has been conducted on carbonate sediments with a focus on large benthic foraminifera assemblage such as Eorupertia magna (La Calvaz), Fabiania cassis (Oppenheim), Eoannulariaeoconica (Cole ve Bermudez), Gypsina sp., Textularia sp., Nummulites perforatus (De Montfort) Nummulites sp., Discocyclina sp., Rotalia sp., Acervulina sp., and calcareous nannofossils such as Cribrocentrum reticulatum, Sphenolithus obtusus, Sphenolithus spiniger, Sphenolithus editus, Helicosphaera compacta, Coccolithus pelagicus, Coccolithus eopelagicus, Reticulofenestra sp., Discoaster sp., Discoaster siapanensis, Discoaster barbadiensis. Therefore, based on the determined index species, the SBZ15?- 17 biozones of large benthic foraminifera and the NP16 biozone of calcareous nannofossils in the studied section have been detected which both assign the Late Lutetian- Early Bartonian (Middle Eocene) age for the section.Also, the Lutetian- Bartonian boundary according to index calcareous nannofossil species was separated carefully, and the first appearance of the foraminifera species of N. perforatus (de Montfort) in the middle part of the deposited sequence was recorded during geological time of the Bartonian stage. Therefore, this fact points that in Iran alike western parts of the Tethys basin, the first appearance of N. perforatus (de Montfort) occurred in Early Barthonian (SBZ17). Systematic of Nummulites perforatus (de Montfort) was described based on typological and biometrical characterization.